The Marshfield Area Chamber of Commerce’s mission is to provide leadership and support for the economic advancement of the community, while serving as a catalyst for the development of programs and services that benefit its members. The Chamber has been building the foundation for a strong business community since 1946. It’s membership driven with approximately 500 businesses and individuals consisting of medical, manufacturing, professional service firms, and retail. The Marshfield Area Chamber of Commerce & Industry (MACCI) needed to make a decision regarding its aging in-house server. The staff did an analysis to determine if it should update the server or move to the cloud. Their research revealed that moving to the cloud would provide more features, benefits and services than remaining with an in-house server, and it would remove the responsibility of maintaining the server. When the MACCI sent out an RFP for the project, Larson said Marco’s thoroughness of the process rose to the top. Larson said when all of the steps had been completed, the actual switch to transfer all of the chamber’s data and applications to Marco’s cloud servers was smooth, uneventful and took less than a day. To help the MACCI get acquainted with the new system, Marco provided one-on one training with each staff member. Now that the MACCI has made the switch to the cloud, Larson said they’re taking advantage of a number of benefits. First and foremost is having server redundancy. “Before if something went wrong with our server, we were down. Now if something goes wrong with our cloud server, Marco automatically switches us over to a different one. Loss of service is almost non-existent,” explained Larson. Another benefit is not having to update software and hardware. 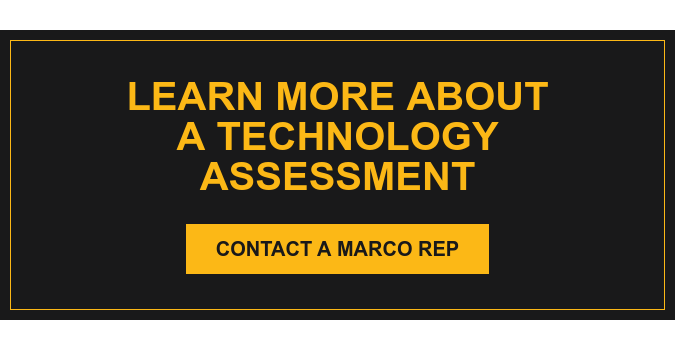 With Marco’s Cloud Services, the chamber receives automatic updates on all of the software. And Larson knows that the system is equipped with the latest security features. Of course, because it’s the cloud, the chamber staff is able to access the system from any location. That provides a convenience they didn’t have before. Perhaps, more than anything, Marco’s Cloud Services provide Larson with peace of mind. “We don’t have to worry about any one of us being the ‘ipso facto tech guru’ here—trying to make sure we’re maintaining the hardware and keeping the system up and running. That’s someone else’s responsibility now. If there’s a problem, we let Marco know and they’re able to jump on it and get it taken care of. For us, it’s plug and play. It’s always there when we need it,” said Larson. Since moving to the cloud, the MACCI has experienced very few issues. But, when they do, Larson said Marco’s service has been thorough and responsive—as it has from the beginning.